"And I'm not making this up," she said. No Theresa, the Telegraph and the Mail did that for you. 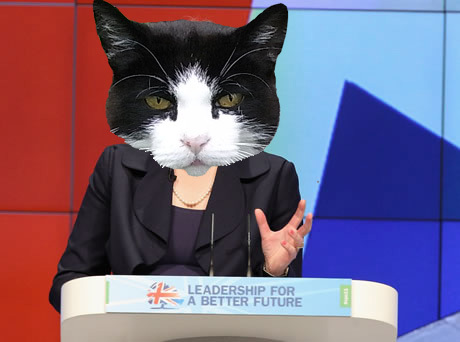 This week saw Theresa May announce her plan to repeal the Human Rights Act, citing the two year old story of the immigrant who was allowed to stay in the country because he owns the cat. "What's really worrying is that this Government is making policies on the basis of false Daily Mail stories." The Mail reported May's plans with glee, in a classic case of "Mail reports on Home Secretary quoting made-up Mail story". This is the same Mail who the day before accidentally posted their pre-prepared and entirely fictional "Amanda Knox guilty of murder" article, complete with invented quotes and reactions, just after Knox was found guilty of slander, and not guilty of murder. Nice to see our glorious leaders allying themselves with the right people, as usual. The full terrifying "lock 'em up and throw away the key" text of Theresa May's speech can be found here. Why Has No One Ever Thought Of This Before?